The U.S. Embassy in Tel Aviv has announced it is closed for routine consular services, and operating on a skeleton staff due to the war. The U.S. Embassy in Tel Aviv has announced it is still closed for routine consular services, and operating on a skeleton staff. 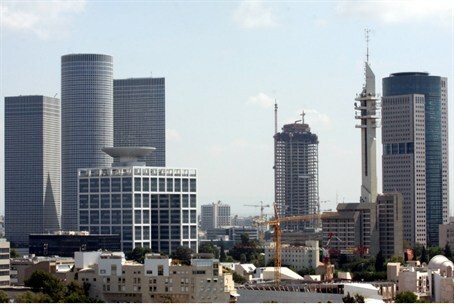 Unending missile attacks by Gaza terrorists aimed at Tel Aviv and the rest of southern Israel have significantly raised the risk level for residents and visitors to the region. Efforts by Egypt and other nations in the region to negotiate a ceasefire that would also end Israel's military response to the rocket fire -- Operation Pillar of Defense -- have yielded little more than talk. U.S. Secretary of State Hillary Clinton arrived in the region on Tuesday to join the negotiations, meeting for two hours with Prime Minister Binyamin Netanyahu in Jerusalem. The U.S. Consulate in Jerusalem, meanwhile, is working as usual and providing full services between its normal hours of 8:30 a.m. to 4:30 p.m., a staff member told Arutz Sheva on Wednesday morning. That, despite the fact that at least three missile attacks have also been aimed at Israel's capital city as well since Friday. The most recent attack was Tuesday. All overshot the mark and landed instead in Gush Etzion. Although the alert referred to the level of violence in Gaza, however, citizens were directed to the “Government of Israel's Home Front Command website” for information on how to choose secure space in a home. A link to the site was provided. American citizens were also provided with websites and daytime telephone numbers for the Consulate General in Jerusalem (02-630-4000) as well as the Embassy in Tel Aviv (03-519-7575). After hours, the emergency phone numbers for the Consulate General in Jerusalem is 02-622-7250. In Tel Aviv, the Embassy's emergency number is 03-519-7551.